Trivia: When filming the scene where Marty is being hanged from the clock tower, Michael J Fox agreed to really hang from the rope. Whilst filming, Fox held the rope away from his throat with his hand. At one time he wasn't holding the rope and was really being strangled. The film crew didn't realise, they just thought it was really good acting, until he passed out. Trivia: The band playing at the Hill Valley festival is rock band ZZ Top (two guys with long white beards playing guitar, and a drummer), who wrote songs for the film. 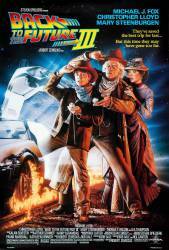 Trivia: Director Robert Zemeckis asked for Clint Eastwood's permission to use his name for BTTF 3. Clint Eastwood felt so honored that he said yes. Doc: Clara was one in a million. One in a billion. One in a googolplex! Doc: Marty, the idea that I could fall in love at first sight! It's romantic nonsense. There's no scientific rationale for it. Marty: Come on, Doc. It's not science. You meet the right girl it just hits you. It's like lightning. Doc: Marty, please don't say that.